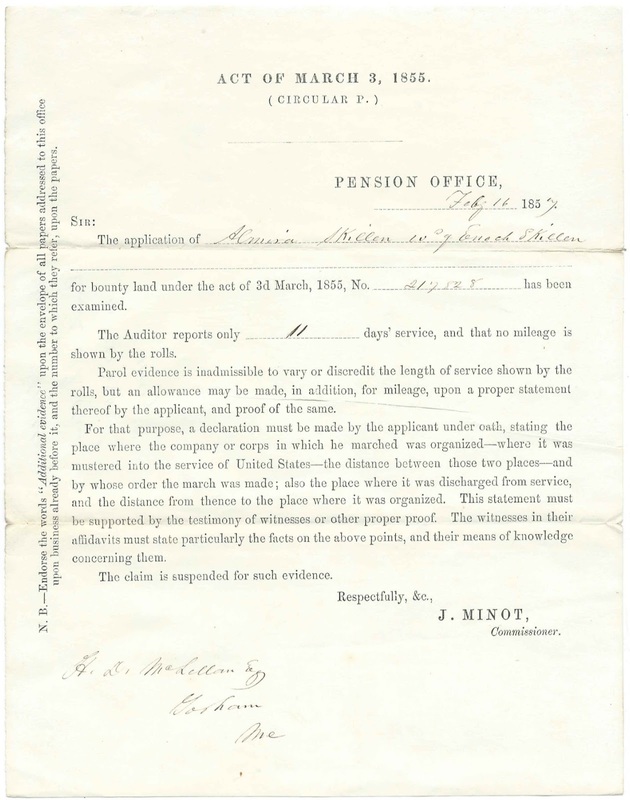 February 16, 1857 document from the Pension Office to H. D. McLellan, Esq., at Gorham, Maine, relating to the application for bounty land by widow Almira Skillen, based on the service of her late husband Enoch Skillen. The document, signed by Pension Office Commissioner J. Minot, indicates that the claim was being suspended until the receipt of further evidence. I don't know whether Hugh Davis McLellan was representing the claimant or whether he was a local agent for the Pension Office. 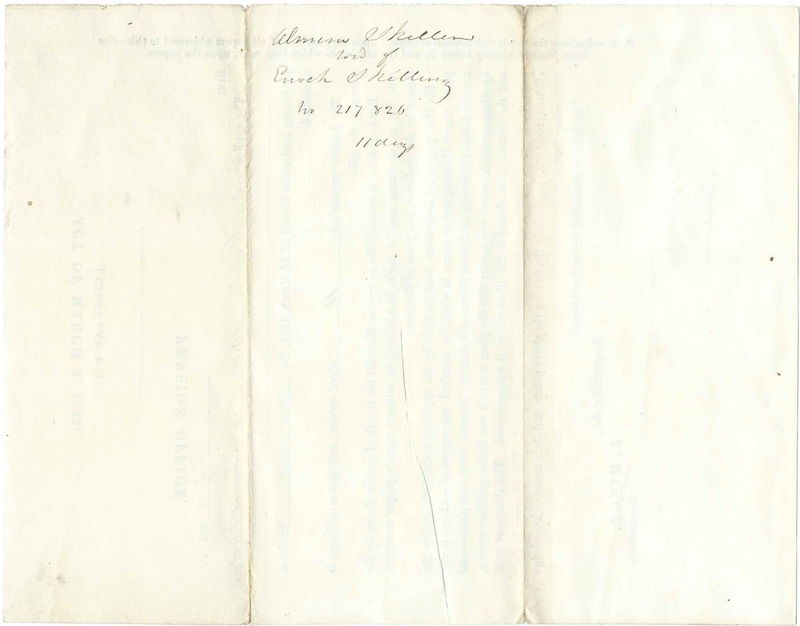 This document was found with another, dated October 13, 1855, addressed to Hugh Davis McLellan regarding rejection of the claim made by Abel Sampson for Bounty Land, based on his service "board the privateer armed ship Yorktown". It's possible that Almira Skillen was Almira (Libby) Skillen, widow of Enoch Skillen of Scarborough, Maine; they were married May 17, 1807 according to the "Maine Historical and Genealogical Recorder", Volume III. The surname occurs in several other variations, including Skillin, Skilling, Skillins, Skillings, etc. 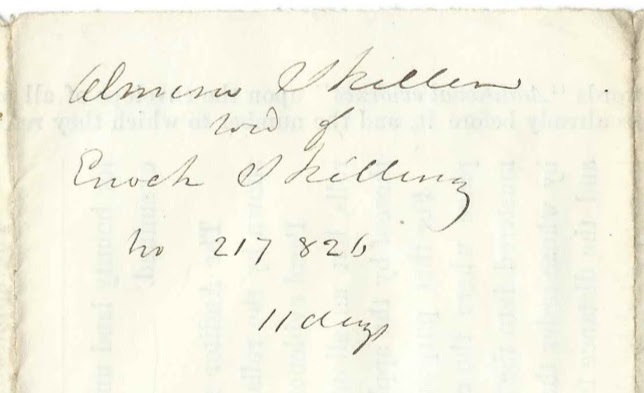 Enoch Skillen was born in 1778 at Scarborough, Maine, son of Simeon and Rebecca (Sawyer) Skillen. Enoch died at Scarborough in 1851. Almira (Libby) Skillen was born in 1790 at Scarborough, Maine, daughter of Nathan and Abigail (Davis) Libby. She died at Cape Elizabeth, Maine, in 1870. Enoch and Almira had, I believe, 9 children, at least two of whom died young. 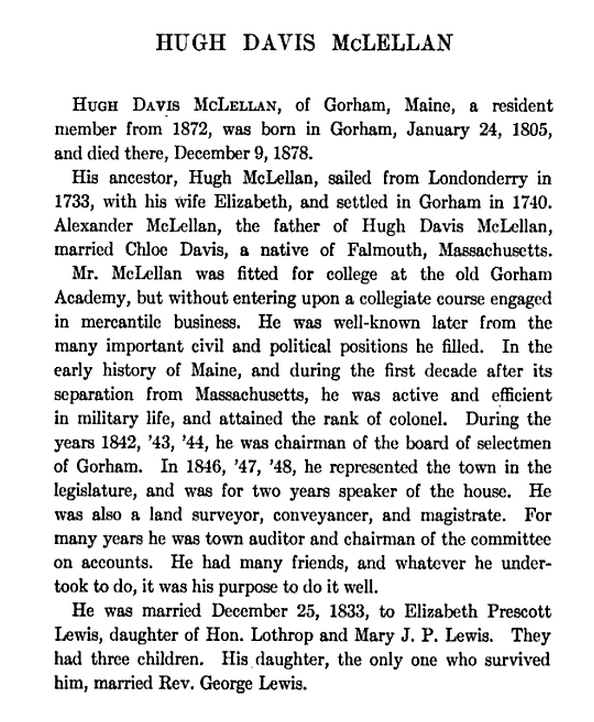 McLellan was also an amateur historian and author, who wrote The History of Gorham with his daughter Katherine Bigelow Lawrence (McLellan) Lewis, wife of Rev. George Lothrop Lewis. An archive of papers, notes and correspondence of Hugh Davis McLellan and family are held at the Maine Historical Society at Portland, Maine.